My boys and I had the opportunity to have breakfast out yesterday. 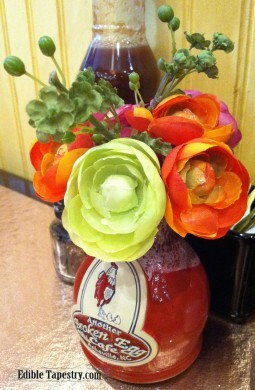 We decided to see what the newly opened cafe in Biltmore Park Town Square was all about. 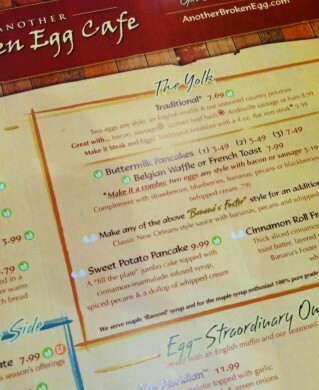 It’s name, Another Broken Egg Cafe, could have implied either that it is a privately owned restaurant whose kitchen staff makes a lot of omelets and sunny side up eggs, or that it is part of a chain. My second guess was correct, according to the company’s website. I prefer to support local, privately owned businesses, but considering the fact that we were planning to spend our day doing lessons and just hanging out at the Barnes & Noble down the street, rather than some cute little independently owned book shop, I figure we didn’t do much more damage by eating at what we weren’t sure at the time was a franchise. 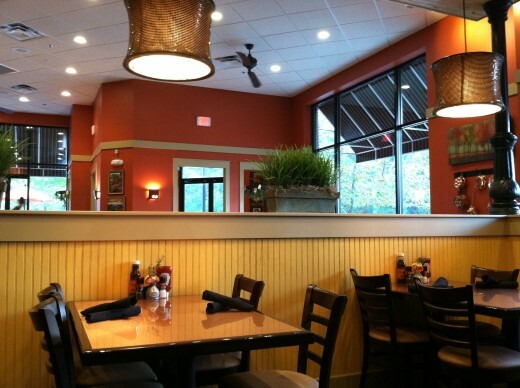 Technically, it may have been the offspring of a large corporation, but nothing about the homey cafe with its sunny yellow beadboard walls, hammered copper tabletops, cloth napkins and rustic pottery coffee mugs felt unoriginal. The impressive menu, just a step above that of a small town diner in price and selection, had our mouths watering. 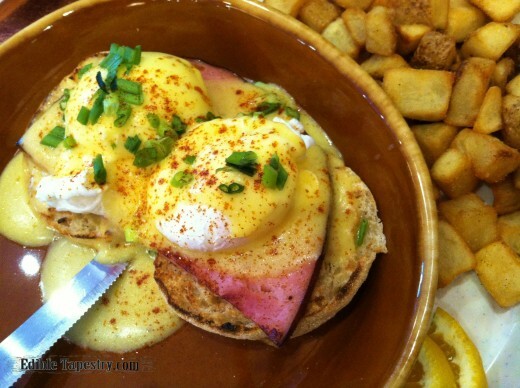 Eggs Benedict is my favorite breakfast dish, so that was a given. If I’m going to give a new restaurant a shot, this dish is the place to start if they offer it. I was curious to see what my boys would choose. I assumed the younger teen would go for the pancakes or a Belgian waffle, my older, something with crab since he likes to try new things. Nope. 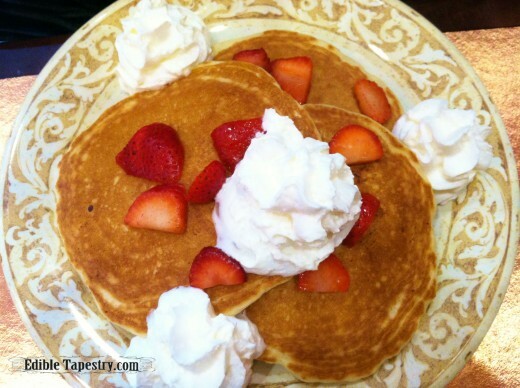 The fifteen-year-old ordered a stack of pancakes with strawberries and whipped cream, the younger boy paired with his old ma and had the Benedict. The pancakes were huge! Fluffy and light. Perfect diner flapjacks, which I’m a huge fan of. He liked them so much that he insisted his brother and I try a bite. 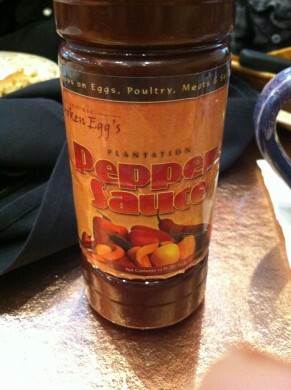 The little guy, being a typical teen, had to sample his with a drop of Broken Egg’s signature sauce, rather than syrup. Funny boy! 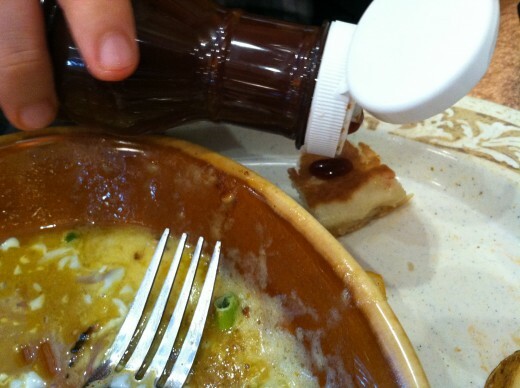 He liked both the sauce and the pancake. Unfortunately, if it wasn’t actually made with hollandaise from a mix, the sauce on the Eggs Benedict tasted as if it had been, and even had a starchy texture. But the eggs were perfectly poached and that’s hard to do, so I was impressed. We call them the cutest little eggs in the whole wide world in our family. And these were CUTE. 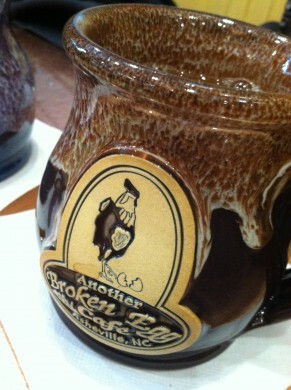 The hash browns were yummy and the coffee endless. The wait staff was all over everything. I also noticed that the entire crew stood quietly and politely in the back of the cafe keeping an eye on things. It reminded me of my old culinary school days, when, as part of course curriculum, we students were required to serve in the school’s three dining rooms that were open to the public. We were expected to wait in the same manner, no chatting or carrying on. This team was excellent. Polite, attentive, informative, and the members really seemed to enjoy working at the cafe. We were told by our wait person, Josh, that the restaurant had only been open for a couple of weeks, but in the first week the company had hosted the family members of the staff so they could “practice on them”. I think it worked. Everyone was very friendly and efficient. The sales-pitch training was also a success. Stuffed to the gills with puffy stuff, Josh’s query, as he cleared our empty dishes, as to whether we would like to order some of the cafe’s beignets had us contemplating coffee refills and an extended stay. Beignets?! How did I miss them on the menu? Effective sales strategy, but we just couldn’t do it. Next time. We will definitely be going back. Now you did it!!!! 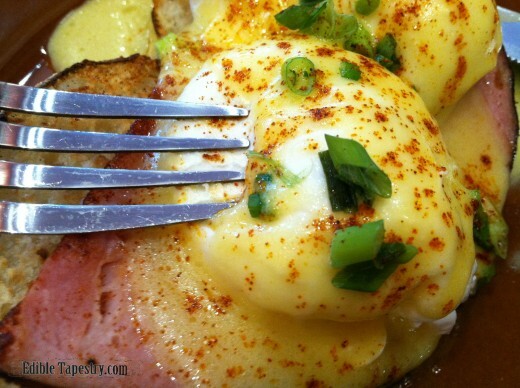 Eggs Benedict are also my very favorite breakfast! Now I’m off the the kitchen to make me some! Just happen to have everything home to make them with. Can taste them already just by your description. Yummy!